Every story has two sides, but some tales move at a turtle’s pace and require patience and a bit of good fortune. For Nia’s sixth birthday, she receives a turtle. The little black girl names her new friend Alfie. Nia adores her new friend and eagerly introduces him to all her friends, declaring that Alfie is 6 like her. As much as she loves him, though, Nia soon runs out of things to do with her laid-back turtle friend, so she “kind of forg[ets]” about him. Before long, it’s time to celebrate Nia’s seventh birthday, and that’s when Alfie gets an idea. The second half of the book follows Alfie as he tries to find the perfect gift to repay the love he feels for the little girl who has shared so much of her world. Heder provides a story that doesn’t rhyme, but it does sing with childlike invention and honesty. Who hasn’t wondered what their pet was thinking or where it went that time it disappeared? 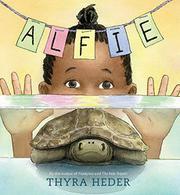 With beautiful, expressive watercolor illustrations, including an astonishing, spare spread that marks the transition between Nia and Alfie as narrators, and clear, concise wording, Heder takes readers on a journey about what it means to be a child with a new pet who sometimes loses its luster but never its worthiness of love.